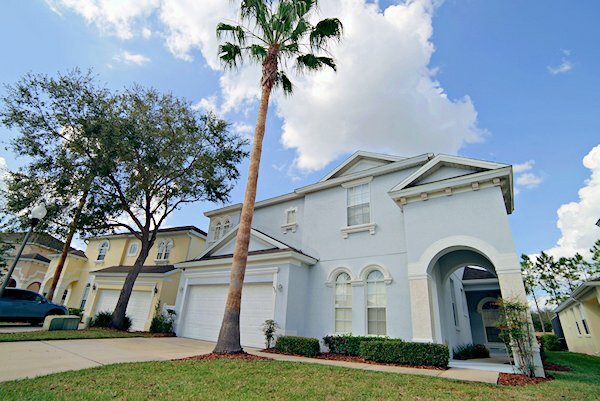 "We have just returned from a memorable family holiday at the Smith’s Disney Villa. We loved the spaciousness of the villa, and how well equipped and clean it is. Calabay Park was lovely and peaceful, but close enough to the theme parks to drive in each day if we wanted to. It was so relaxing to return to the house after spending the day in the hustle and bustle of the parks, and the children enjoyed a swim in the pool before bed. There are several large Publix supermarkets nearby, so we were able to pick up groceries on the way past, and a huge choice of restaurants within easy reach. Booking online was simple, and the owner came back to us with confirmation and answered all our questions very quickly. We would definitely recommend, none of us wanted to leave!" 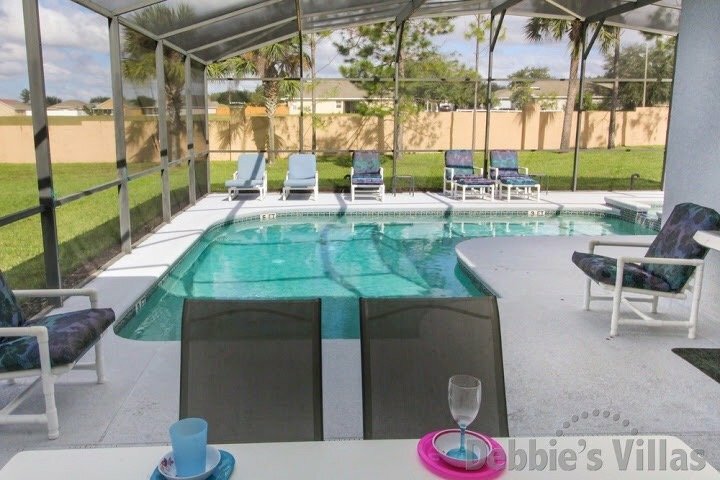 "What an absolutely beautiful property and very well presented. We are very happy with it"
"Thank you so much for letting us rent out your villa - it is lovely!!! We had a great time! If we go back we would definitely get your villa again if it was available but we would have more villa days!!!" "We enjoyed this week and your place was great. We will be back." "Had an awesome time in the villa, it accommodates all your needs and is a great location. Hope to be back soon"
"We had a fabulous holiday in Florida. The villa, pool and pool table/games room have been great. If we get the chance to come back, we would definitely like to stay here again"
"Amazing time, great location, pool used almost every day. Would love to stay again on our next visit. With three couples the en-suites were greatly appreciated. Fabulous !!" "My family and I really enjoyed our visit to Florida. It was wonderful having your house to stay in. It gave us lots of room to spread out and not be living on top of each other. 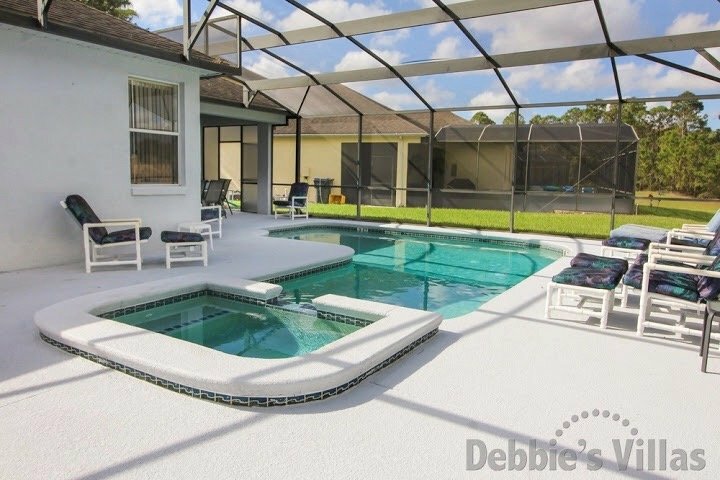 If we have a chance to coming back to Florida we would love to rent your house again and would definitely recommend your house to any friends that are interested in visiting Florida"
"Thank you for our lovely stay, the villa was superb. We go home with lots of great memories from our time in Florida." "Fantastic time was had by all - Villa beautiful and very spacious - Lots of extras. Would recommend to any family or friends who wish to visit Florida." "We had a great time and loved the villa & games room and will be definitely recommending it to other people going there"
"Villa is great – lots of room, love TV’s in all the rooms. Enjoyed everything. Great time of year to visit. Will be recommending to friends and family. Marco & Amand Proath, David & Hannah Williams Oct 2010 "
"Fabulous time was had !! Villa is excellent, location brilliant and lots of space for everyone, couldn’t fault it. Will be recommending to lots of people. " "Thank you so much. The villa is everything and more than we expected. Our holiday has been great and we will recommend your villa to everyone. What a real nice villa and a great location. Everything goes so smoothly from this location. I would recommend this villa to anybody wanting a real good time. This has been well suited for our family of 8 people. It gives enough space for privacy, yet still"
"Thank you for the villa. We had a fabulous time and we found the house gorgeously appropriate. We had loads of space for our guests. We had a wonderful time. Thank you so much. " 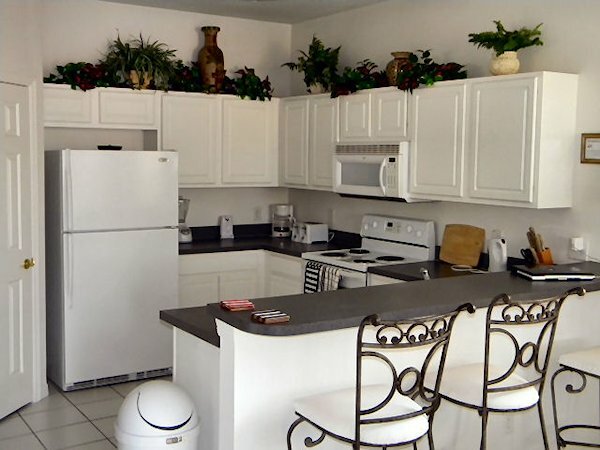 Situated on the southern side of US27 towards the intersection with Interstate 4, Calabay Parc offers 3-5 bedroom executive style homes and relaxation through a woodland retreat of nature trails. Villas are finished to a high specification and many have over-sized plots set amongst established landscaping. The area very much caters for golfers, with many courses located nearby. Although there is the local Ridgeview Plaza parade of local shops just over a mile south of Calabay Parc, the nearest Publix supermarket is a little over 3 miles north on US27. At this shopping complex there are also a number of eateries including Applebees, Quiznos, an Indian take-away and a wine & bistro parlour. The nearest Walmart is approximately 3 miles further north - just after the junction with US192. Heading south on US27 for around 3.5 miles towards Interstate 4, there is the Posner Park shopping centre offering major stores including JC Penney, Target, Ross, Dress for Less and many more. Again, there is a further selection of restaurants available. 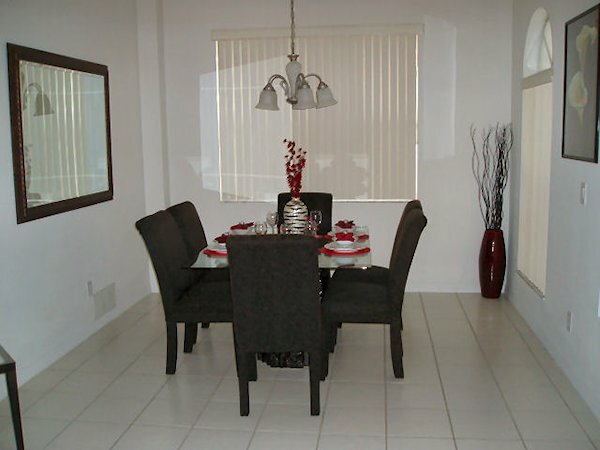 Approximately 4 miles east of Calabay Parc lies the ChampionsGate development, which hosts a number of restaurants, shops and the Omni Resort hotel - offering fine dining for that special occasion. This comprises of a large dining table with 6 chairs and is ideal for large parties and formal dining. The laundry room is fitted with washer, dryer, iron, ironing board. No need to bring loads of clothes with you when you can wash them - save the space in your luggage for all those cheap designer clothes you can buy at the outlet malls. 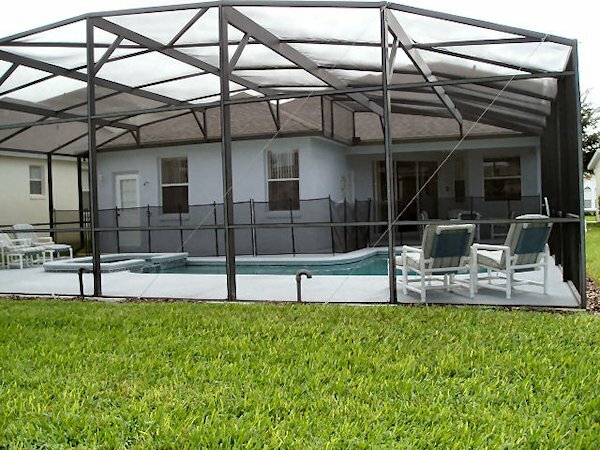 The open plan family room has sliding patio doors that lead directly onto the pool deck. 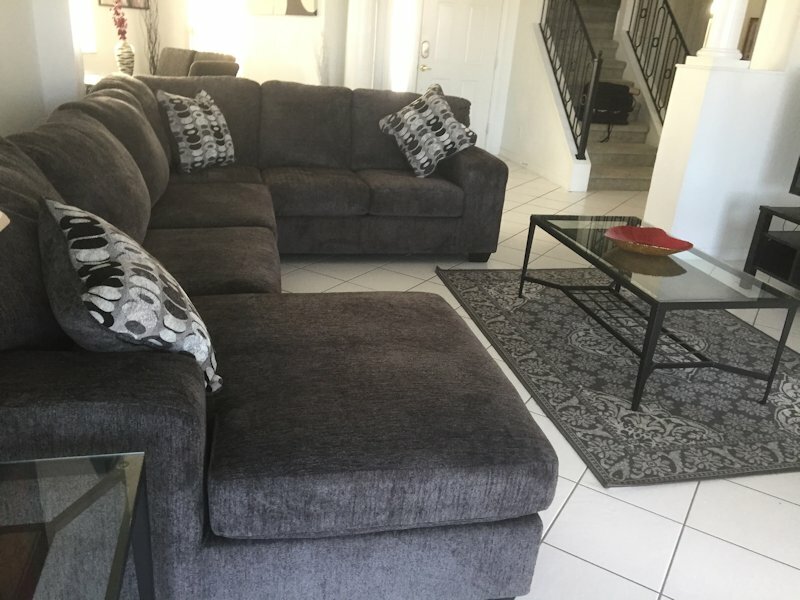 There are 2 large comfortable sofas.There is also a coffee table and 2 side tables. We have also provided a large TV with a selection of family friendly DVDs, games and numerous books for your enjoyment. 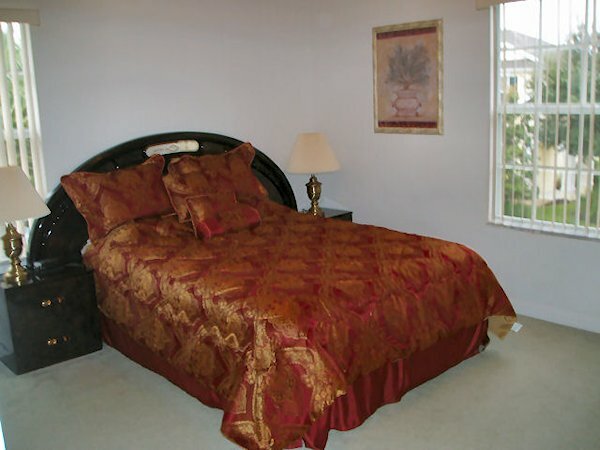 The large master bedroom overlooks the pool and has a king sized bed, a large walk-in wardrobe. The connecting spacious en-suite bathroom has a large bath, walk-in double shower, his & her vanity unit and a separate WC. The second master bedroom situated at the front lower level of the villa has a queen sized bed, and built-in wardrobe. The en-suite bathroom with shower, single vanity and WC. 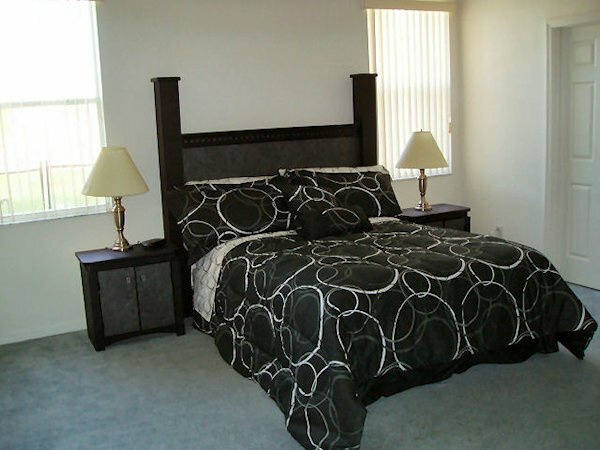 The third master bedroom is situated at the front upper level and has a queen size bed, and a built-in wardrobe. The en-suite bathroom with shower, single vanity and WC. There is a bathroom at the pool which comprises a WC and wash-hand basin. There is also an outside shower next to the pool. 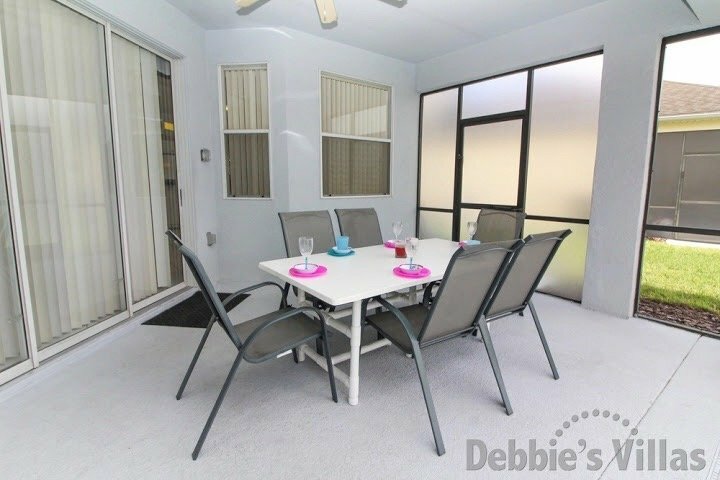 The covered lanai area offers a shady retreat from the hot Florida sun and is the perfect setting for an alfresco breakfast, lunch or dinner. At night, the area can be floodlit for BBQs and keeping an eye on evening swimmers and is great for a totally private romantic meal overlooking the underwater lit pool. Two patio tables with 8 chairs as well as sun loungers are all provided for your use. Our villa is equipped with free high speed Wireless Internet Access which works throughout the villa and pool deck. There is a secure password which will be supplied to guests. There is a games room which has a pool-table, air-hockey, foosball and a dart board - ideal for those who want a break form the sun !! 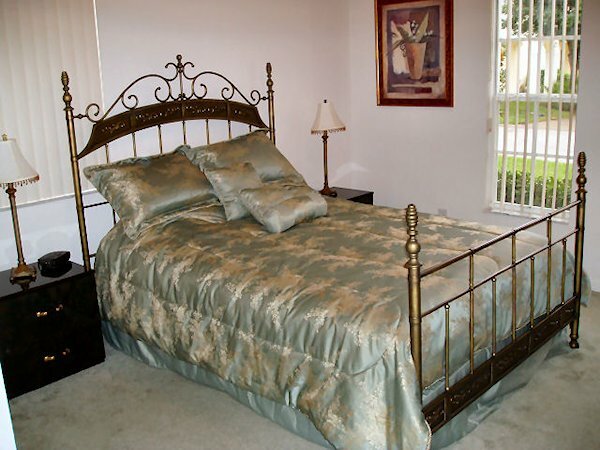 All towels and linens are provided although we do ask that no linens or towels be removed from the house. If you plan on travelling to the beach on either coastline, please bring your own beach towels. Everything else you may need to know is in the big information book inside the villa, or you can ask our friendly and efficient local villa manager.